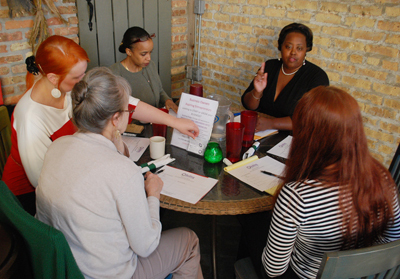 NEWâ€™s Crainâ€™s Small Business Day was a blast, and full of nuggets of wisdom by our fabulous guest speakers. 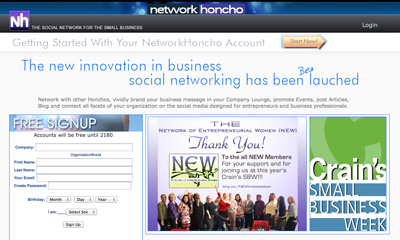 During our meet and greet ladies mingled and were introduced to NetworkHoncho.com with their pop-up of a new small business networking tool that is currently in beta launch. 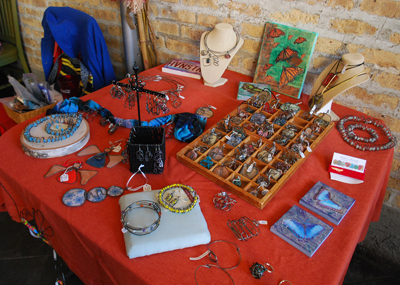 Members and visitors also perused my wares at my pop-up table. Then we gathered around for formal introductions and a business card exchange, with a variety of very interesting businesses represented. 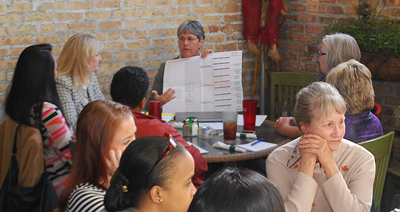 After learning more about each other we split into three groups for roundtable discussions. Peggy Goddeau discussed retirement planning, highlighting how inflation and taxation do not increase at the same rate, and we thus have to base our retirement planning on projected true buying power. She recommends a balance between cash flow and debt management based on three categories of assets: protection, savings and growth. As a financial advisor with The Heartland Group, Peggy offers consulting services for anyone at any age to ensure their retirement is on the right track. Dr. 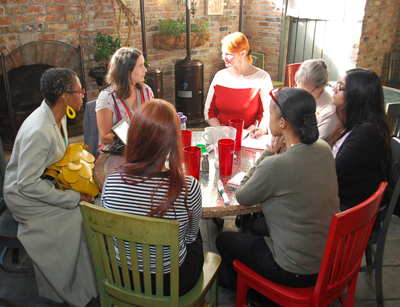 Crystal Foreseman Landers offered wellness tips which included an 80/20 rule for eating whole foods (80% of the time), and allowing for 20% of not-so-nutritious meal or snack decisions. This would allow for 2 â€˜cheatâ€™ meals a week, creating less pressure than a vigorous diet. She also recommended having lean protein with each meal to counteract food cravings, and paying attention to what we are eating instead of multitasking while we chew. She also recomended drinking 1/2 of your body weight in ounces to stay properly hydrated.Â Dr. Crystal offers additional naturopathic health tips at Living Tree Natural Health, Inc. Author and speaker Niquenya D. Fulbright discussed the 4 Pâ€™s of profit, which are not price, product place or promotion, but passion, purpose, partners and productivity. She recommends that to achieve a goal, we need to make a list of weekly steps to get there. This makes long-range planning far more effective, because we know we can do one thing a week in a specific category, and then feel more accomplished about doing another thing the next week. She also stated that sunk cost should never be considered when making a decision (and who isnâ€™t guilty of hanging on to something just because we spent so much time and money on it already?). As President and CEO of Building Bridges Consulting, Niquenya transforms dreamers into successful entrepreneurs by giving them the tools to turn their passion into a viable business. After all this insightful learning it was time for a pint and we gathered around to dine on our host Shannonâ€™s Irish Pubâ€™s delicious food. NEW will gather tomorrow in Geneva for our November Meet & Munch. 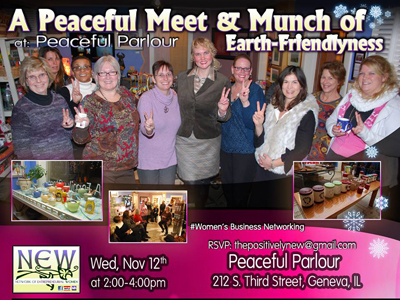 We will revisit the lovely Peaceful Parlour for some tea time and to gather ideas for eco-friendly holiday shopping. 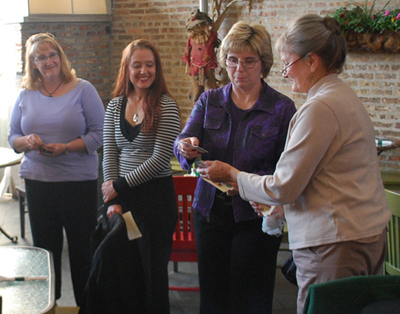 Peaceful Parlour is an eco-friendly shopper’s paradise located in Geneva, IL. The boutique offers products that are locally made, USA made, natural or organic, hand crafted and made from renewable or sustainable materials. Their focus is to find products with environmental and community benefits, supporting local artists, small businesses, fair trade and women co-op groups around the world. Due to Thanksgiving, this will also be our only event for November. 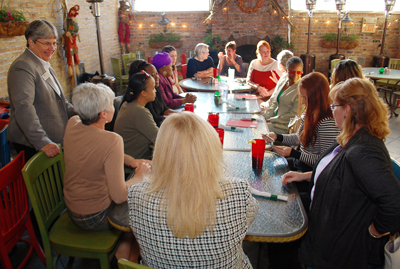 No Wine, Women and Wellness on 11/27, since we’re all likely to be gathered around dinner tables. This entry was posted in Business, BusinessNetworking, PositivelyNEW and tagged Building Bridges Consulting, Business Networking, Crain's Small Business Week, finance, Living Tree Natural Health, NetworkHoncho, NEW - Network of Entrepreneurial Women, Peaceful Parlour, pop-up, positivelyNEW, profit, roundtable discussion, SmallBizWeek, The Heartland Group, wealth, wellness.